We would like take this opportunity to introduce ourselves as your complete automotive repair facility. Conveniently located directly off Interstate 287 on Durham Avenue in South Plainfield – we are only minutes away from you. Since 1972 J&L Auto Center’s mission has been to provide our customers with the best automotive service possible for the most economical price without sacrificing quality of workmanship for all areas of automotive services: Collision – Mechanical – Accessories. 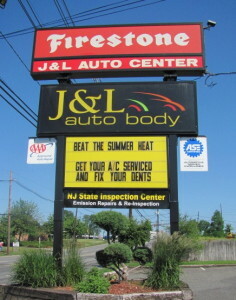 J&L Auto Center – Your Paint and Body Shop Experts!